Tyrone have scored 6-77 in their four championship games to date in 2017. TYRONE MANAGED TO clear a hurdle yesterday they fell at in devastating fashion to Mayo 12 months ago. Mickey Harte’s side were upset by underdogs Mayo at this stage last season, when many felt the Ulster outfit would go close in the race for Sam Maguire. The Red Hand dished out an 18-point pummelling to Armagh in the All-Ireland quarter-final to book a last four meeting with back-to-back champions Dublin in the last four. “We walked out of here at the same stage last year and we were not happy people because we had put a lot into the year up to that and we’d played enough football that day to at least get a second chance and we didn’t get it,” he stated. Tyrone have scored 6-77 in their four wins over Derry, Donegal, Down and Armagh to get to this point. “Maybe one of these days we’ll not be seen as a defensive team,” Harte quipped when that figure was put to him. It would be wrong to classify Tyrone as a defensive outfit, but rather they are a brilliant counter-attacking team. They’ve had an incredible spread of scorers and don’t rely on any one player to put up big tallies, although Mark Bradley, Peter Harte and Sean Cavanagh are all important contributors. 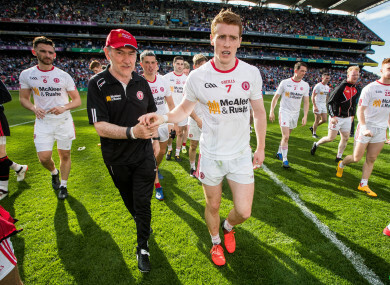 Depsite the big winning margin, there were areas of concern for the Tyrone boss. “We wouldn’t be particularly happy with how we got into that position. We stumbled our way into that kind of lead. We didn’t play with poise or real quality. We picked off some good scores, the penalty was significant and the goal meant there was a good cushion there. He reserved special praise for the impact of substitute David Mulgrew, who posted 2-1 in a scintillating display off the bench. “He’s a good young footballer. That’s why he had played a lot in the Ulster championship and it was probably a bit difficult on him not to start this one. Again, you have to look at the contribution Declan McClure gave in the Ulster final and you’d say it would have been a big thing not to let him start today either. Email “'Maybe one of these days we'll not be seen as a defensive team' - Mickey Harte”. Feedback on “'Maybe one of these days we'll not be seen as a defensive team' - Mickey Harte”.